A storm, a shipwreck, and five stranded Japanese fishermen picked up by an American whaler. The problem? They can never go home. Because of Japan’s strict isolationist policy and fear of outsiders, those who leave Japan can never return. When the other fishermen are put off in Hawaii, Manjiro is offered the chance to journey on to America. America! A land of opportunity, the captain tells him, where even a poor fisherman can become someone important. Where Manjiro receives an education and training as a cooper, where he enjoys the status as the captain’s son, where he rides his very own horse. But the more Manjiro learns of the world, the more he fears for the safety of his people, who have no knowledge of anything beyond their own shores. “Are you going to get up and help the world change?” Mrs. Whitfield asks him one day. Can he, Manjiro, a fisherman’s son, really change anything? Can Japanese and American ever overcome their differences? Can he persuade his people to open themselves to the world that is passing them by? But how, when he can never return home? 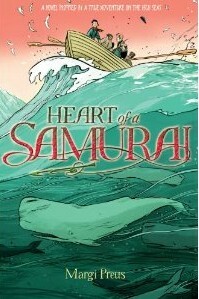 Heart of a Samurai, by Margi Preus, contains everything I love about middle grade fiction. A grand storyline, a strong, maturing hero, gorgeous era-enhancing word pictures, and a deep foundation of goodness and truth. It is a real-life story, that of Japanese whaler John Mung (Manjiro), complete with illustrations drawn by Mung. It is well put together and critically acclaimed. Yet I have mixed feelings. I never felt compelled to continue reading. I found some statements abrupt, without a proper lead in. The sentences sometimes felt short and choppy. And the change of heart of the story’s villain felt contrived. This book simply didn’t capture me. Yet I found it interesting, and I learned a great deal about Japan. I also appreciate its message of freedom, equality and reaching across differences. So I will recommend The Heart of a Samurai on its many strengths, yet I cannot give it five stars, as so many others have. This sounds like a great book! I think you’d like this one. It’s worth reading.